After receiving my BSc in Biology from Trent University, I studied aquatic toxicology and physiology at Wilfrid Laurier University under the supervision of Michael Wilkie, professor in Laurier's Department of Biology. 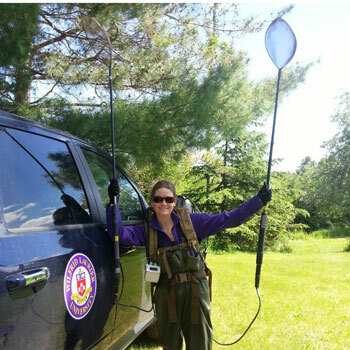 My MSc thesis focused on improving invasive sea lamprey (Petromyzon marinus) control in the Great Lakes through the use of lampricides such as TFM (3-trifluoromethyl-4-nitrophenol). I compared the metabolic scaling physiology of larval sea lampreys with their uptake and excretion rates of radio-labeled lampricide (14C-TFM) across a range of body sizes and life stages. Continuing in this field of study at Laurier with Dr. Wilkie, I am currently working on my PhD in Biological and Chemical Sciences. I am studying the toxicity of TFM, which is highly influenced by water chemistry. As pH and alkalinity decrease, more TFM is available in its lipid soluble un-ionized (phenol) form, which increases the rate it will be taken up by an aquatic organism and ultimately increase its toxicity. Non-target effects of TFM are minimal, and water chemistry in the field is carefully monitored during applications to minimize deaths in non sea lamprey species. However, sudden fluctuations in pH may affect TFM speciation and toxicity. In this study I will be comparing the responses of a model organism, the rainbow trout, to that of the culturally significant juvenile lake sturgeon, both of which are often found in streams being treated with TFM. Specifically, I will be monitoring changes to the gill microenvironment at various water chemistries, both with and without TFM exposure. 14C-TFM will be used to measure the amount of TFM being taken up by the fish under different water conditions. Furthermore, ventilation strategy is proposed to influence the gill microenvironment and I want to explore this in more detail. Lake sturgeons, as bottom-feeders, have adapted unique ventilation when feeding where they implement a quasi-tidal water flow over the gills. It is hypothesized that this will decrease their effectiveness at removing metabolic wastes, such as acid excretion (CO2) at the gill, and may lead to increases in TFM uptake and toxicity. To test this, water chemistry at the gill will be measured while the mouth of the sturgeon mimics natural feeding behaviours. It is crucial that TFM applications are implemented in a way that does not negatively affect lake sturgeon, a protected species. Using pharmacological and physiological techniques, this research will highlight the role that the gill plays in TFM uptake, speciation and toxicity in the two organisms, and how that role is influenced by water chemistry. This study may improve pesticide management decisions by providing information on how non-target fishes respond to lampricide applications, and how that response changes with water quality.